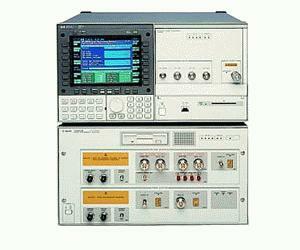 The Agilent 71612C error performance analyzer is the ideal solution for the research, development and manufacturing test of Gbit lightwave and digital components, devices and subsystems from 100 Mb/s to 12.5 Gb/s. With this high performance serial pattern generator and error detector, you can perform error analysis to verify the operation and quality of lightwave submarine cable systems, SONET/SDH telecom and datacom transceivers, Gbit datacom serial links, high-speed logic devices, and optical amplifiers and modulators. The analyzer can be used to test 10.6 Gbit ethernet and forward error correction (FEC) rates giving you a breadth of applications to help you thoroughly test and characterize your devices for complete confidence in your product. The four sub-rate outputs of the 71612C are suitable for the generation of 3.125 Gb/s test patterns required to test the XAUI interface of 10 Gigabit Ethernet devices. What is more, the alternate pattern mode of operation allows synchronous selection of the de-skew and data patterns.